But there is a way to make change happen faster. Companies can better capitalize on the diversity they already have by including more diverse employees in business decisions at all levels. Directly measuring this inclusive behavior focuses attention on leadership actions that executives can take today. The simple concept of inclusive decision making can bring about faster change -- and contribute directly to the bottom line. Our newly published free inclusive decision making white paper outlines ground-breaking Cloverpop research showing that inclusion drives better business performance because inclusive teams drive better business decision making. 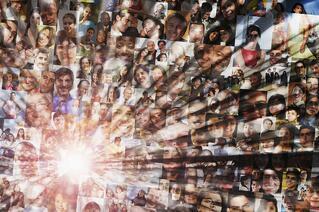 Diverse teams make better business decisions up to 87 percent of the time. Decisions made and executed by diverse teams delivered 60 percent better results. “Diversity and inclusion must go hand-in-hand to drive results,” said Laura Sherbin, CFO and Director of Research at the Center for Talent Innovation. “Cloverpop's research bolsters the case that employers who build diverse and inclusive teams see the best outcomes." 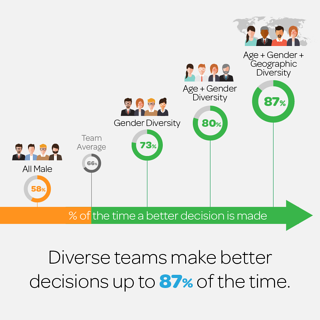 According to the research, teams outperform individual decision makers 66 percent of the time, and decision making improves as team diversity increases. Compared to individual decision makers, all-male teams make better business decisions 58 percent of the time, while gender diverse teams do so 73 percent of the time. Teams that also include a wide range of ages and different geographic locations make better business decisions 87 percent of the time. We also found that diverse groups are more likely to encounter operational friction when executing business decisions. In short, less diverse teams make worse decisions, and then diverse teams struggle to put their decisions into action. The worst situation is to have an all-male team make a decision that is executed by a gender-diverse group. This worst-of-both-worlds combination underperformed by 15 percent. In contrast, our analysis found that the most inclusive decision-making and execution teams performed 60 percent better than average. Unfortunately, non-inclusive decision making is all too common. All-male teams make about 38 percent of the decisions in a typical large company. The gap is even worse among less diverse companies like those in Silicon Valley’s technology industry, where teams including women make less than half of business decisions. “Given the competitiveness of the tech industry,” said Aileen Lee, founder of Cowboy Ventures who coined the term unicorn to describe billion-dollar startups, “if you don't have women and diverse people involved in decision making at all levels, you are putting your company in a vulnerable position." On the flip-side, this is a tremendous opportunity for companies to use inclusive decision making to improve business performance. It’s the most significant business activity -- Bain and Co. research shows that decision making effectiveness is 95 percent correlated with financial performance. So making improvements to your company’s decision making gives a sure boost to your bottom line.